For most students at South, participation in clubs doesn’t include working for an online blog, attending interstate camps or traveling to Budapest, Hungary. However, junior Alex Economou’s passion for Model UN has brought him all of these experiences and more. Beginning his Model UN career as a freshman, Economou did not expect to be very involved with the club. Now, according to club advisor Terrence Jozwik, Economou attends almost every conference and is determined to do well in each one. Jozwik explains that Economou continues to participate and work hard for his success, no matter the difficulties he faces. Economou says that his connection with Jozwik is special because he views him as a role model. Economou has received advice from Jozwik that has helped him with life outside of Model UN. According to Nyssa Beckwith, club advisor and social studies teacher, Economou has many strengths in Model UN, but his passion is most evident. Such passion has driven Economou to work for the Model UN website Best Delegate, participate in camps all over the country and even go to Budapest with the All-American Model UN team. According to Economou, during the summer going into sophomore year, he attended an ambassador program run by Best Delegate at Georgetown University. He said he was able to learn essential conference skills and found an opportunity within their media department. Economou did not always know about this passion. 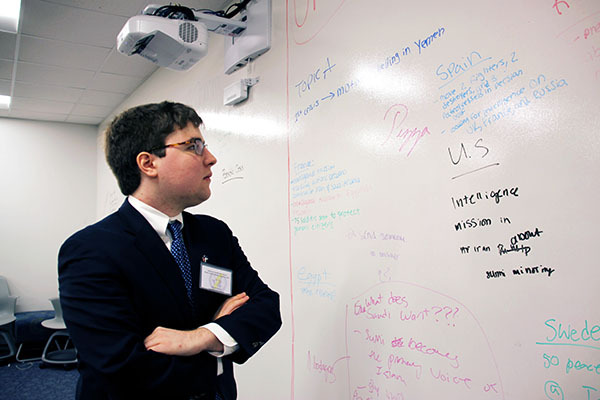 It was not until after getting recognition at his second conference at Vanderbilt University that Economou found his enthusiasm for Model UN. Since then, Economou has become increasingly involved with the Model UN team, along with other committees internationally.According to Beckwith, preparation for conferences can be strenuous, but Economou says the reward comes with recognition. Such recognition came recently at the Model UN team’s trip to New York City in March, where Economou won Best Delegate for his committee and had an opportunity to speak at the United Nations. For Jozwik, watching Economou deliver his speech in front of the UN was a moment of great pride, and a special part of Economou’s Model UN career.